In 1788 nineteen-year old Blayney Townley Balfour inherited the estate of Townley, County Louth from his grandfather. Sensitive, intelligent and affluent, around the time he came of age Balfour consulted with architect Francis Johnston about building a new house at Townley to replace the existing structure: Johnston had not long before completed work for Archbishop Richard Robinson at nearby Rokeby Hall (see Building on a Prelate’s Ambition, February 4th). At that stage the proposed design was not dissimilar from that seen at Rokeby, the idea being to construct a tall pedimented block. The project proceeded no further before 1791 when Balfour departed for France with his mother and sisters. Leaving them behind in Nice, he went on to Italy and spent time exploring the heritage of Florence and Rome, in the latter city meeting the Scottish neo-classical architect James Playfair. Following Balfour’s return to Ireland in early 1793 he received three designs for a new house from Playfair and while some of the ideas these contained (specifically the notion of a sunken courtyard at the rear of the building to accommodate kitchen and other services) were eventually incorporated, none of them was used by Townley Hall’s owner. Informed by all he had seen on mainland Europe, once back in Ireland Balfour reverted to Francis Johnston. Yet the outcome of this commission seems to owe as much to client as architect. 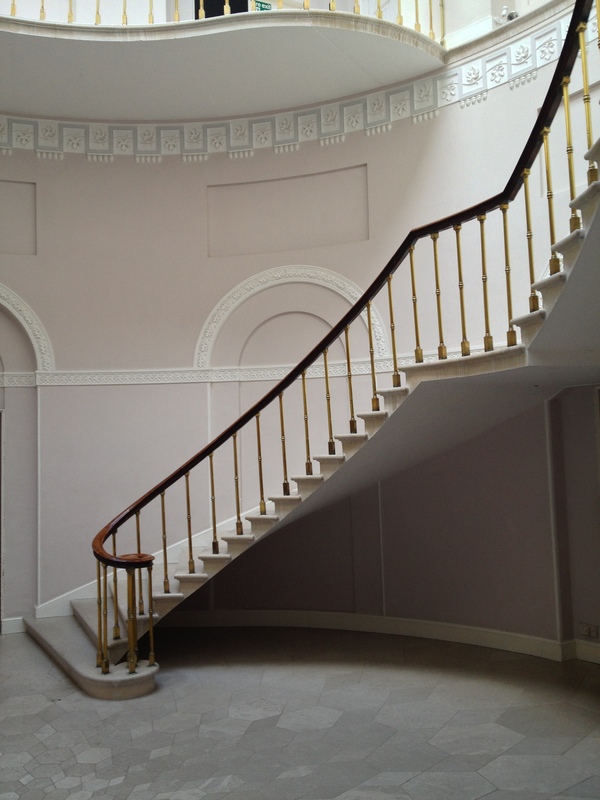 Indeed Balfour and one of his sisters Anne produced their own drawings for the proposed house and came up with its most distinctive feature: the circular central stair hall. Nevertheless the specifics of Townley Hall were designed by Johnston and it is justifiably considered to be his masterpiece. From the exterior, the building could not be more simple and unadorned: an apparently two-storey block (there is also a basement, and an attic level concealed behind the roof parapet) faced in limestone with each side of seven bays (except for the rear) and measuring ninety feet. The entrance is distinguished only by a plain porch with paired and fluted Doric columns and the windows are no more than openings in their respective walls. The interior of Townley Hall is equally spare, but the occasional decorative flourish is so well applied and the quality of workmanship so flawless that the result is a building of rare refinement. Even so, nothing prepares a first-time visitor for the coup de foudre which lies at the heart of the house: its stair hall. 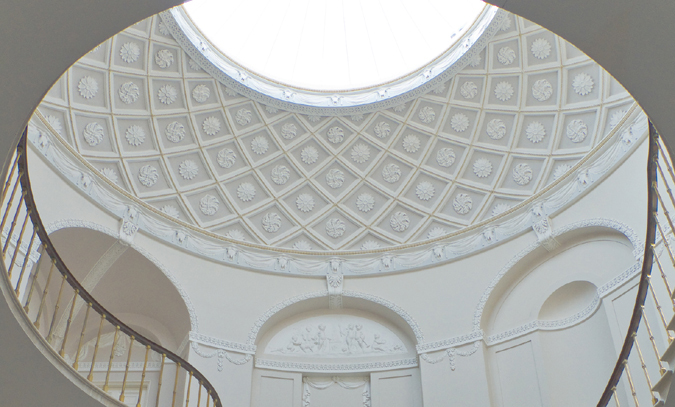 This space owes an obvious debt to Palladio’s Villa Rotonda and to the Pantheon, both that in Rome and that designed in London by James Wyatt in 1772. Indeed Wyatt’s influence on Johnston’s work at Townley Hall is generally accepted, not least because in 1796 Blayney Townley Balfour married Lady Florence Cole whose family lived at Florence Court, County Fermanagh which is not far from Wyatt’s own neo-classical masterpiece Castle Coole. 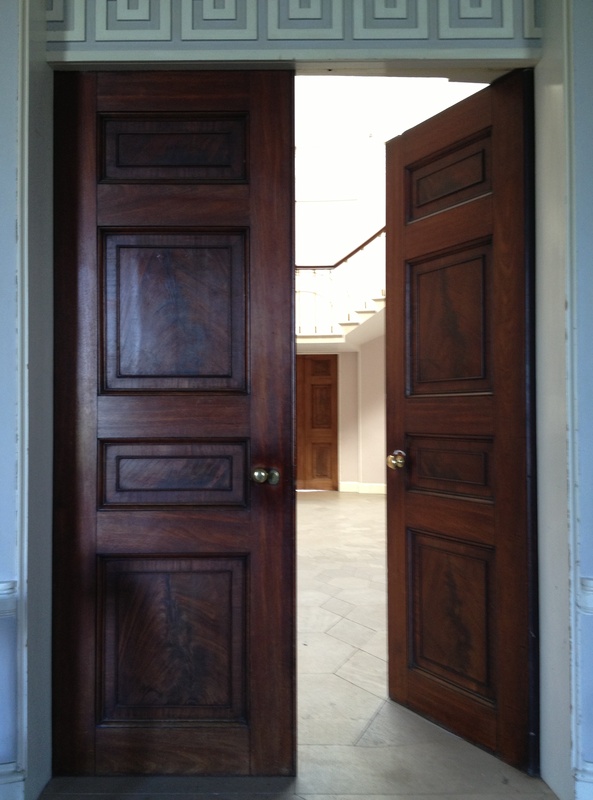 Four mahogany doors set on the cardinal points and within relieving arches open into the stair hall. 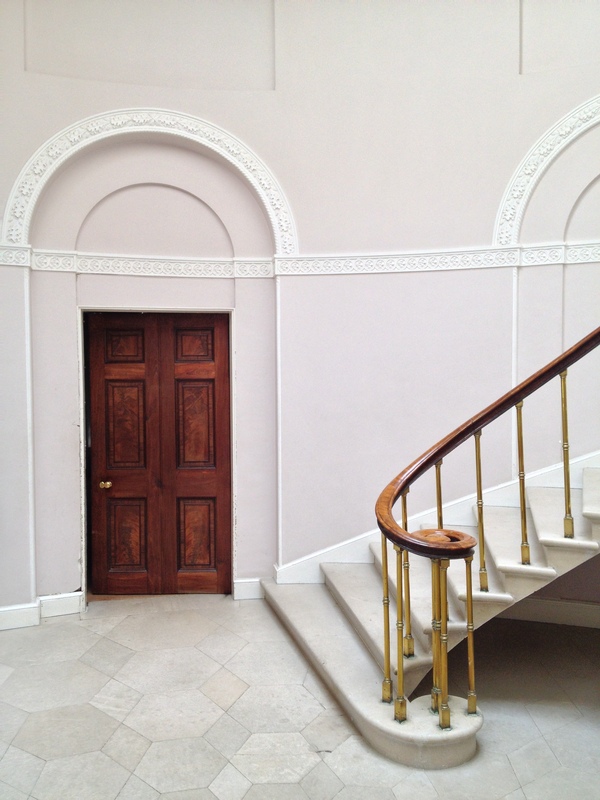 The cantilevered Portland stone stairs (with slender brass balusters finishing in a mahogany handrail) rise with gentle sinuosity around the wall perimeter, breaking once to form a landing directly above the door facing that from the entrance hall. At this level the doors are surrounded by arched frames which are also repeated around the curved walls, even when the stairs intervene. In order to minimise the divide between ground and first floor Johnston devised a shallow stepped Greek key border interwoven with a vine tendril, lines of acorns hanging from the lower section. 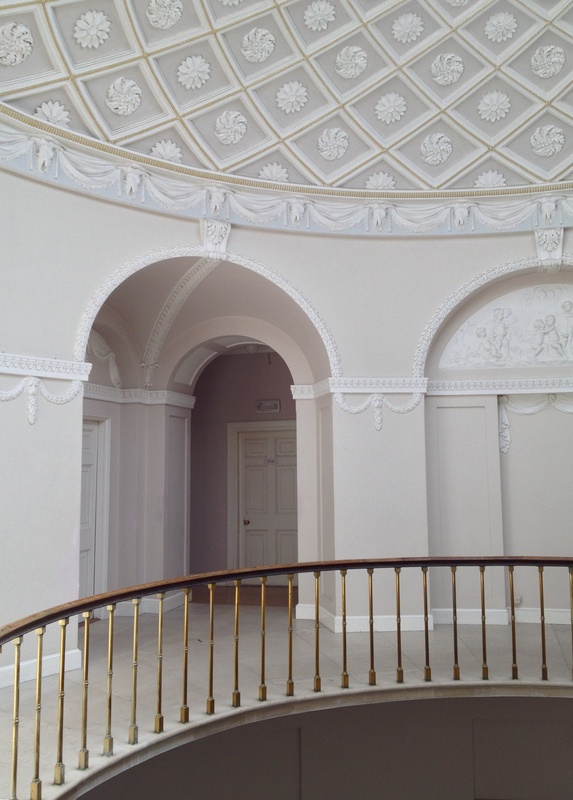 Once on the landing, greater degrees of decoration are permitted, not least in the treatment of a further series of arches alternately left clear and filled with stuccowork of frolicking putti (and in three places they open into shallow lobbies providing access to bedrooms). At their topmost point these arches are tied by keystones to a frieze beneath the dome of ox skulls between swathes of drapery. Above it all rises the lightly coffered dome of thirty feet diameter, the central portion being glazed. There are times when language cannot do justice to a work of art, and Townley’s stair hall is one of them: the pictures shown here are infinitely more eloquent. 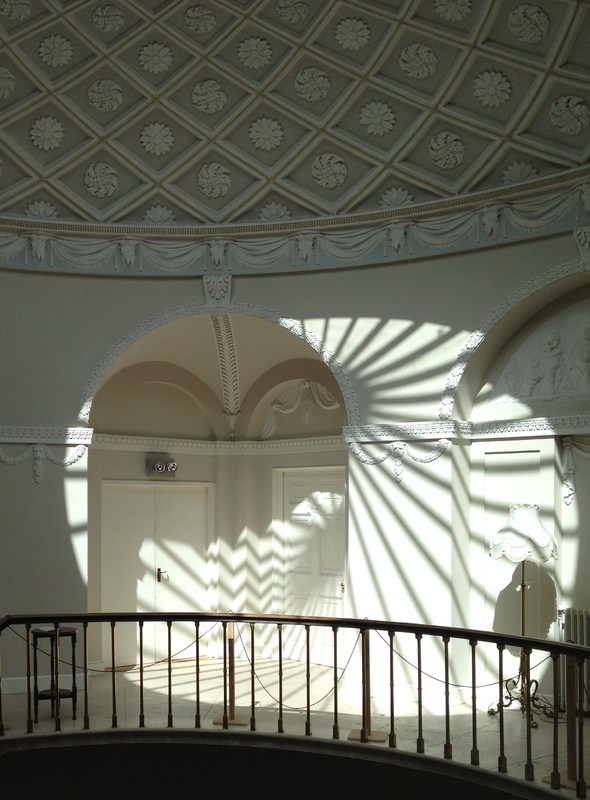 The elegance of proportions, the perfection of form, the play of light on surface all combine to make this without question one of the loveliest rooms in the country, a flawless piece of design, the culmination of 18th century Irish architecture and a tribute to those responsible for its creation. No longer a private house, the building is now under the care of the School of Philosophy and Economic Science which is currently undertaking a programme of repair. *From Charles Baudelaire’s L’invitation au voyage. With thanks to Michael Kavanagh of MVK Architects. This entry was posted in Architectural History, Country House, Louth and tagged Architectural History, County Louth, Georgian Architecture, Historic Interiors, Interior Decoration, Irish Country House, Stately Home, The Big House, Townley Hall. Absolutely sublime! 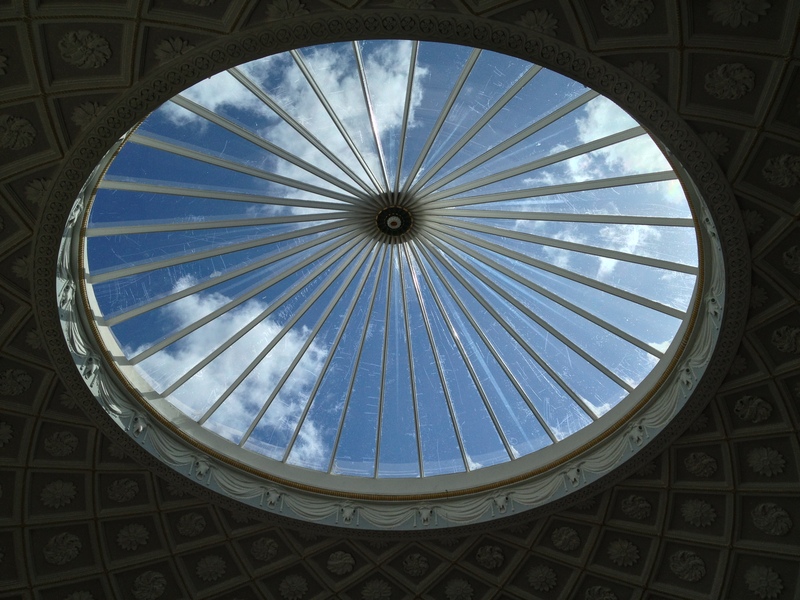 Thank you for sharing such ‘exquisite architectural beauty’ on a Monday morning! 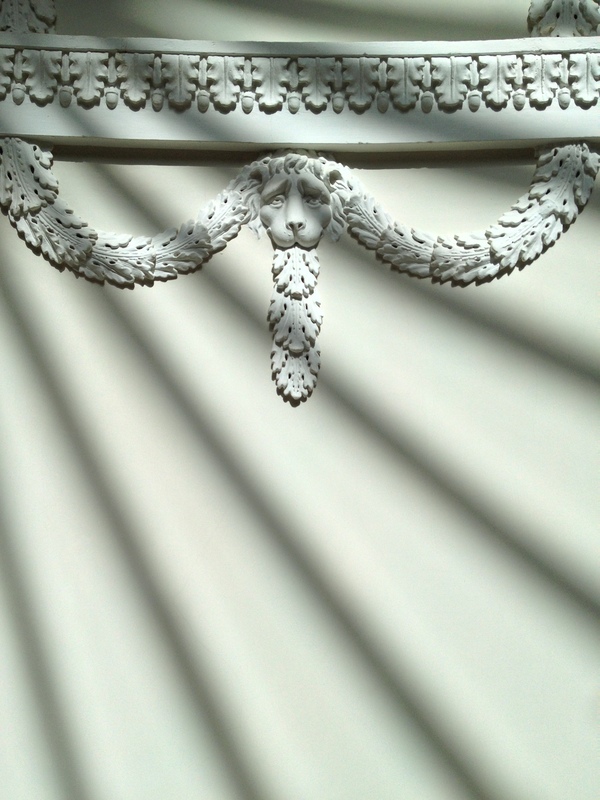 Yes, sublime is absolutely the mot juste for Townley Hall’s stair hall. One of the loveliest places you will ever see and definitely worth visiting if you are in the area. The organisation which now owns the building is most helpful and wiling to permit visitors interested in architecture. What wonderful detail. I must visit. Initially one is overwhelmed by the beauty of the space and only gradually does the eye adjust and take in the quality of the detail and the impeccable craftsmanship. It is certainly worth a visit. Thank you for your comment. Dear Robert. Do you think the chimneys should be restored? At the moment, the original window frames are being restored, so one must allow that sensitive and considerate work is underway on the building. It is such a huge undertaking (and so costly) one cannot ask for too much. set, they ll take you in with their taste and charm, and before you know it you ll be reading sandskrit and doing menial tasks! I can assure you it is an unlikely prospect. The Osymandias argument. These painted, as in Dulux, but un decorated spaces leave much to be desired. The ambition and energy of the original commission and the lives lived therein seem so distant, rendering the houses sad and provincial…something one could never say in the context of the pantheon. I imagine the neighbours at Baronscourt understood this when they called on David Hicks to reinvigorate/modernise their decor in the 60’s…. Actually old photographs of the stair hall show it to have been left without furnishings or other decoration; the architecture is sufficiently authoritative to require nothing else. And it may be the quality of my photographs but the paint is not in any way offensive. I had missed this, but I’m glad that I have come across it this evening, as I sip my sherry, and do a bit of long overdue catching up. But this is certainly helps cheer me up; it is exquisite, and I do so favour this rather edited style. I note some electrical lighting fitments, which I can only imagine make it more enjoyable at night. I envy you the sherry! The edited style in this case is ideal because the architecture requires no intervention. There are a few lamps, plants and so forth which I removed as much as possible while taking the pictures and it would be even better without those, but the structure is sound and that is the most important thing. Thanks as always for your interest and comments. “this is certainly cheers me up” is clearly a case, (not literally), of the jerez fino effect. It’s not like a visit to the vicar’s however; over ice in these temperate climes! I was very interested to learn more about Townley Hall. I have recently been compiling a catalogue of Chinese wallpapers in the historic houses of the National Trust, together with Andrew Bush and Dr Helen Clifford. 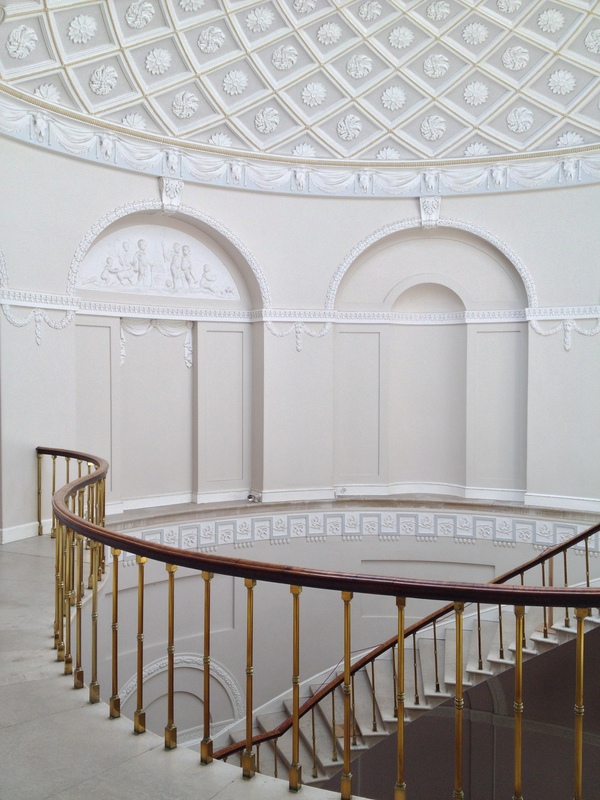 We found out that one of the houses owned by the NT, Florence Court in County Fermanagh, used to have a Chinese wallpaper (sadly lost in a fire in 1955) that seems to have had a connection to the Chinese wallpaper formerly at Townley Hall and now at Winfield House in London. The Townley Hall paper seems to have been supplied by the Hon. Arthur Cole (1780-1844) who worked for the East India Company, and who was the brother of Lady Florence Townley Balfour. Their eldest brother, John Willoughby Cole, 2nd earl of Enniskillen, lived at Florence Court, so the Chinese paper there, which was very similar (though not identical) to the paper at Townley, may also have been brought back by Arthur Cole. However, we haven’t found any exact dates for the introduction of the Chinese wallpaper at Florence Court. Would you perhaps know when the Chinese wallpaper was hung at Townley? Thanks for your enquiry – regrettably I am unable to answer you at the moment. Certainly it makes sense that there would be a link between the Townley Hall paper and that at Florence Court, given the connection between the two families and Lady Florence’s interest in architecture which she shared with her husband. I will see what else might be discovered in any of the archive resources here and if I discover helpful information, I will revert to you as soon as I can. You’re most welcome, I will get back to you should any information turn up. Meanwhile, thank you for the kind comment about my Apollo columns on your own site!